Served with your choice of toast, buttermilk pancakes, English muffin, bakery muffin, biscuit or fresh fruit. 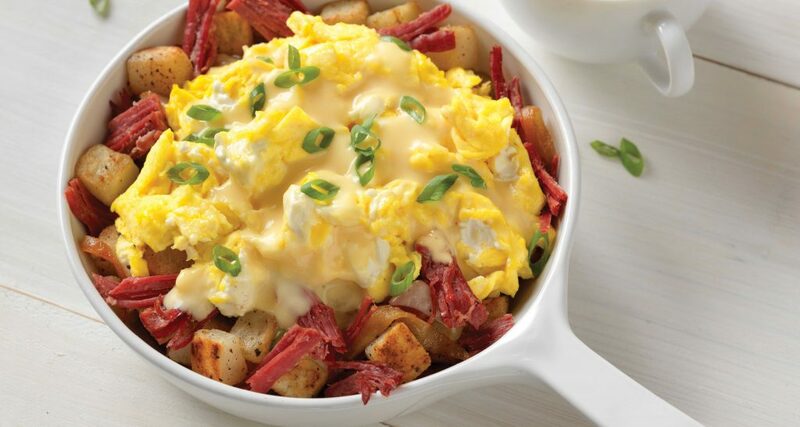 Scrambled eggs, cream cheese, hand-shredded corned beef, caramelized onions and melted Swiss cheese served on grilled breakfast potatoes covered with a rich hollandaise sauce. 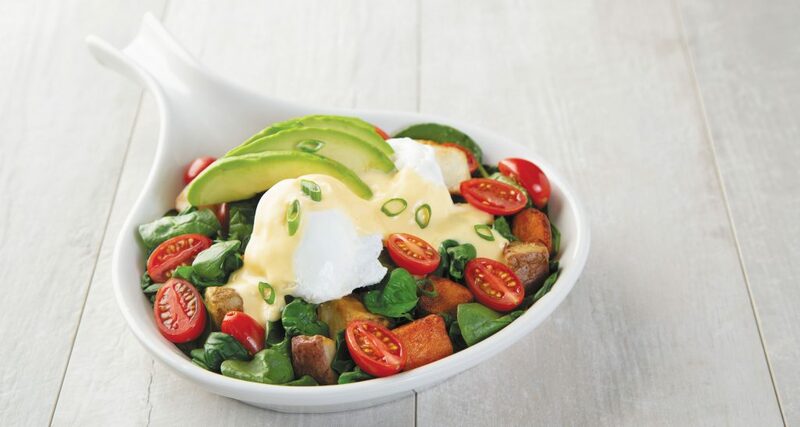 Fire-roasted potato medley with grape tomatoes and spinach, topped with two poached eggs. Smothered in hollandaise sauce and topped with avocado and scallions. Country sausage, cherrywood-smoked bacon, onions, red peppers, mushrooms and cheese. Topped with country sausage gravy and two eggs, any style. 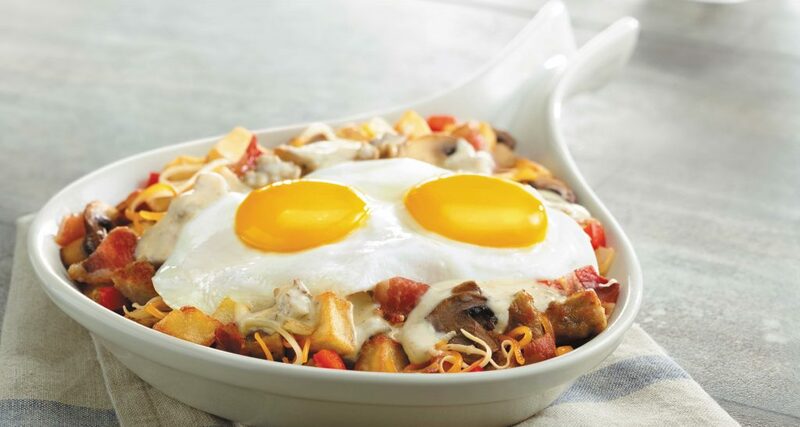 Two cherrywood-smoked bacon strips, two sausage links, ham, mushrooms, green peppers, tomatoes, onions and melted cheddar cheese served on breakfast potatoes with two eggs, any style. Chicken-fried steak and onions smothered in country sausage gravy served on breakfast potatoes with two eggs, any style. Two eggs scrambled with cream cheese, mushrooms, green peppers, broccoli, spinach, tomatoes, onions and feta cheese served on breakfast potatoes. Two eggs scrambled with cream cheese, ham, mushrooms, green peppers, tomatoes, onions and melted cheddar cheese served on breakfast potatoes. Served with seasoned hash browns** or fresh fruit** and your choice of toast, buttermilk pancakes, English muffin, bakery muffin or biscuit. **Excludes Corned Beef Hash, which is served as described. 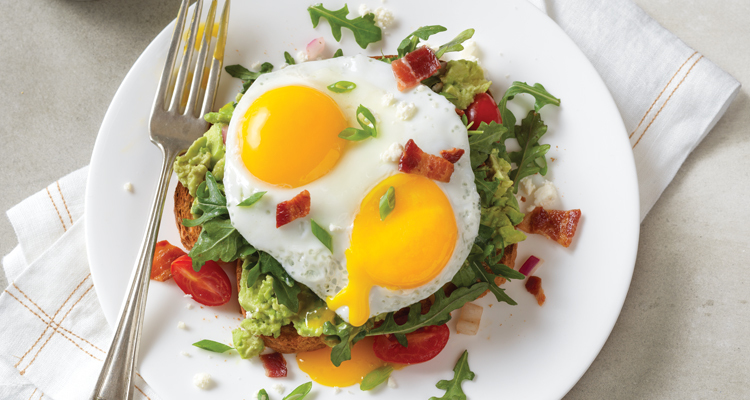 Smashed avocado covered with arugula and grape tomato salad, topped with your choice of two eggs, any style, chopped bacon, and feta cheese. Served on top of wheat toast with a side of fresh fruit. Two eggs, any style, with two cherrywood-smoked bacon strips, two sausage links and a half portion of ham steak. Two eggs, any style, served with a full-size ham steak. 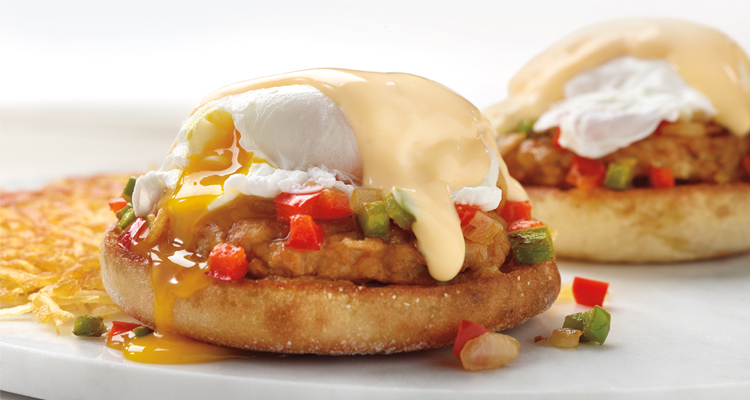 Two eggs, any style, served with chicken-fried steak smothered in country sausage gravy. 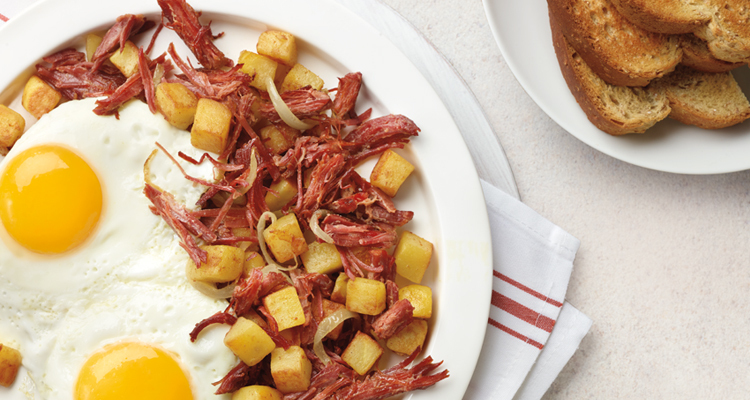 Hand-shredded corned beef, caramelized onions and breakfast potatoes with two eggs, any style. Add fresh fruit for an additional charge. Enjoy two eggs, any style. 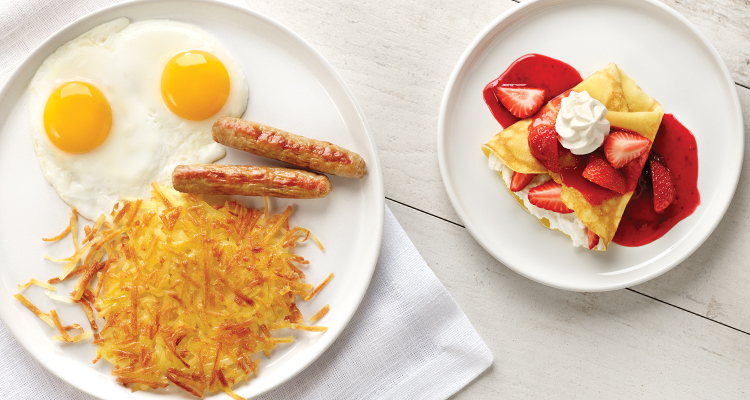 Morning, noon or night, it’s breakfast made just the way you like. Two eggs, any style, with your choice of four cherrywood-smoked bacon strips, four sausage links or two house-made sausage patties. Served with your choice of two cherrywood-smoked bacon strips, two sausage links or one house-made sausage patty. 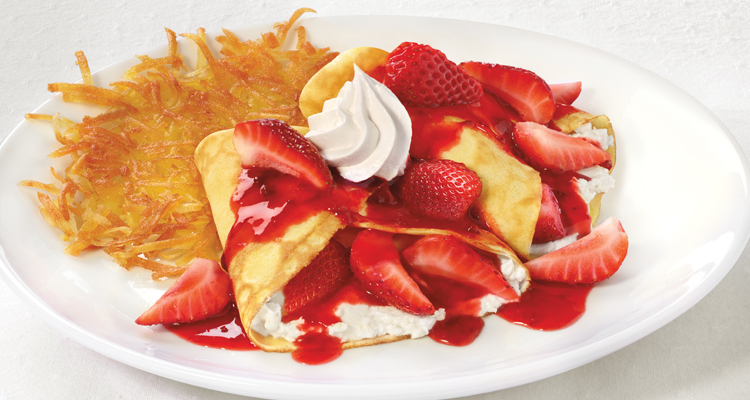 Two made-from-scratch crêpes stuffed with sweet supreme cream cheese and fresh strawberries, topped with more strawberries, strawberry sauce and real whipped cream. Served with seasoned hash browns. Four pieces of our hand-battered French toast served with two eggs, any style. A four-stack of pancakes served with two eggs, any style. A classic Belgian-style waffle served with two eggs, any style. All toppings served with real whipped cream. Served with seasoned hash browns or fresh fruit and your choice of toast, buttermilk pancakes, English muffin, bakery muffin or biscuit. Egg whites or low-cholesterol egg substitute available by request. 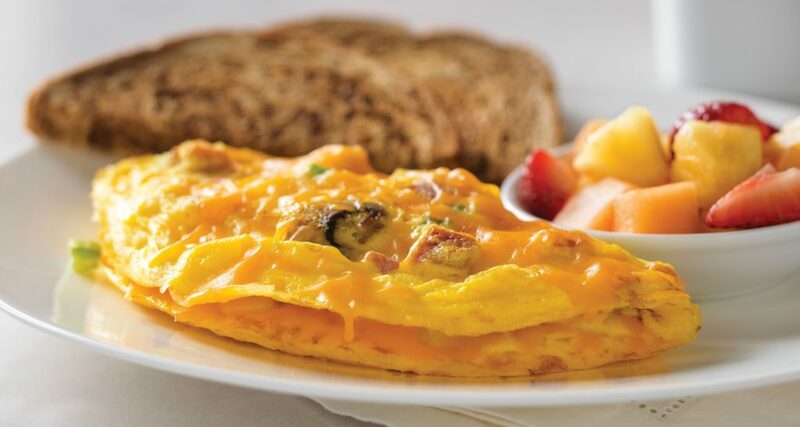 A three-egg omelette with ham, mushrooms, green peppers, tomatoes, onions and cheddar cheese. 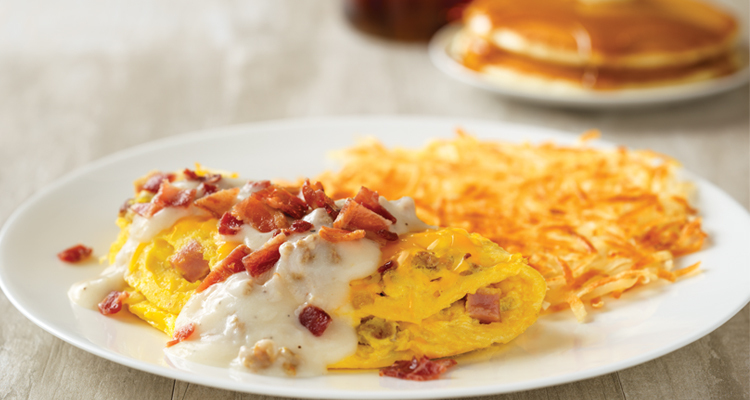 A three-egg omelette stuffed with country sausage, ham and onions, topped with melted cheddar cheese, then smothered in country sausage gravy and chopped bacon. A three-egg omelette with green peppers, mushrooms, onions, tomatoes, broccoli, spinach and feta cheese. Traditional frittata filled with sautéed potatoes, onions, mushrooms, red bell peppers and spinach topped with melted cheddar cheese, tomatoes, avocado and sour cream. Choose two ingredients. Add additional items for an extra charge. 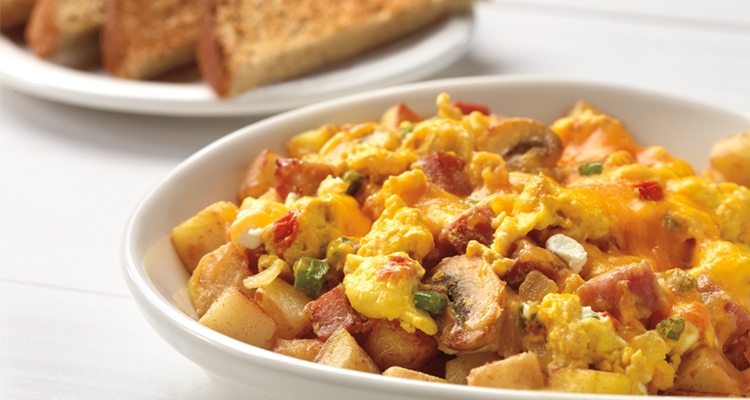 Served with your choice of seasoned hash browns or fresh fruit. House-made country sausage patties, grilled peppers, onions and two poached eggs over English muffin halves covered with pepper jack queso. 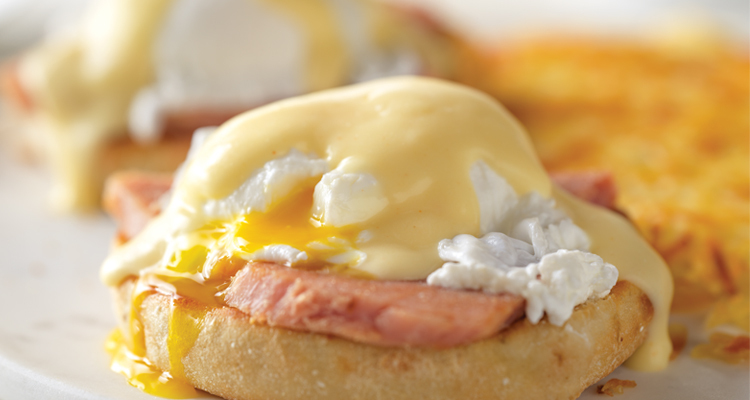 Smoked ham and two poached eggs over English muffin halves covered with hollandaise sauce. 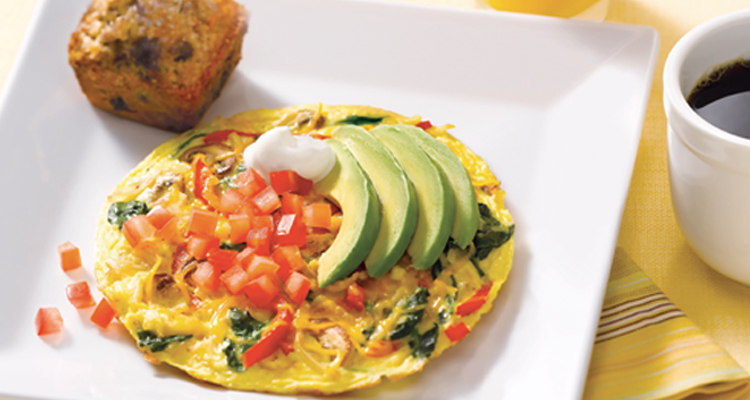 Choose 4 different items to create your own breakfast. Add a 5th item for an additional charge. Substitute a supreme item for an additional charge or add a supreme item for an additional charge. No duplicate items. Please choose 4 different items. Limit 7 items total. Please, no 4-Square® sharing. *Can be cooked to order. NOTICE: Consuming raw or under-cooked meats, poultry, seafood, shellfish or eggs may increase your risk of food-borne illness. Gluten Sensitive Menu is available in-restaurant upon request. **Free Pie Wednesday™ offer details: For locations in Ohio and Wisconsin, free slice of pie with the purchase of any entrée and a beverage. For all other locations, except Ohio and Wisconsin, free slice of pie with the purchase of an entrée; side items and pie slices do not qualify as an entrée. For all locations: No coupon necessary. Dine-in only. Available from 10:30 a.m. until close. Limited time only. May not apply to all pie varieties and excludes Specialty Desserts, such as Caramel Apple Pie à la Mode, Brownie à la Mode, Cheesecake and Carrot Cake. Excludes Pie Shop Special and Bakers Bundle®. One slice per person per purchase per visit. Valid only at participating restaurants. Not valid with other offers, promotions, discounts or coupons. Tax and gratuity not included. Promotion subject to change. See restaurant for details.